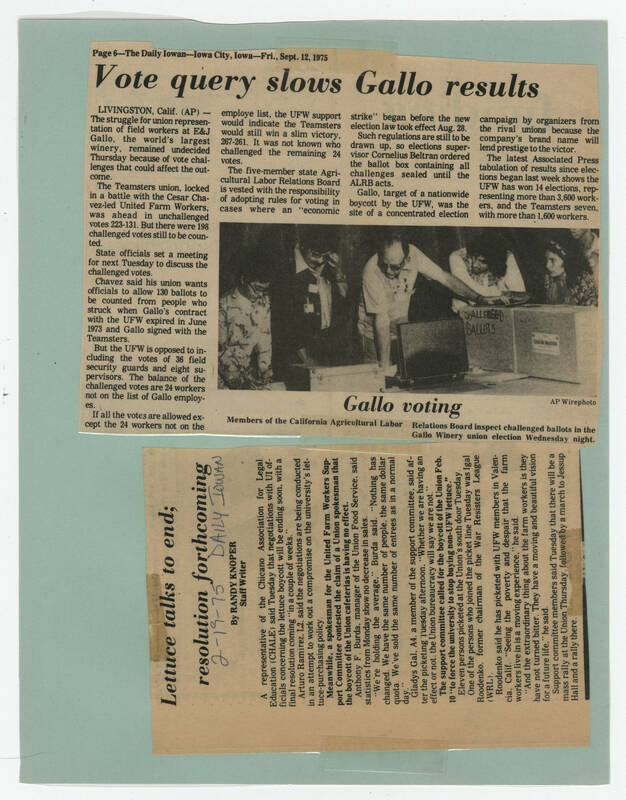 [[Top of page]] Page 6--The Daily Iowan--Iowa City, Iowa--Fri., Sept. 12, 1975 [[Header]]Vote query slows Gallo results [[end header]] [[Article text]] LIVINGSTON, Calif. (AP) -- The struggle for union representation of field workers at E&J Gallo, the world's largest winery, remained undecided Thursday because of vote challenges that could affect the outcome. The Teamsters union, locked in a battle with the Cesar Chavez-led United Farm Workers, was ahead in unchallenged votes 223-131. But there were 198 challenged votes still to be counted. State officials set a meeting for next Tuesday to discuss the challenged votes. Chavez said his union wants officials to allow 130 ballots to be counted from people who struck when Gallo's contract with the UFW expired in June 1973 and Gallo signed with the Teamsters. But the UFW is opposed to including the votes of the 36 field security guards and eight supervisors. The balance of the challenged votes are 24 workers not on the list of Gallo employees. If all the votes are allowed except the 24 workers not on the employee list, the UFW support would indicate the Teamsters would still win a slim victory, 267-261. It was not known who challenged the remaining 24 votes. The five-member state Agricultural Labor Relations Board is vested with the responsibility of adopting rules for voting in cases where an "economic strike" began before the new election law took effect Aug. 28. Such regulations are still to be drawn up, so elections supervisor Cornelius Beltran ordered the ballot box containing all challenges sealed until the ALRB acts. Gallo, target of a nationwide boycott by the UFW, was the site of a concentrated election campaign by organizers from the rival unions because the company's brand name will lend prestige to the victor. The latest Associated Press tabulation of results since elections began last week shows the UFW has won 14 elections, representing more than 3,600 workers, and the Teamsters seven, with more than 1,600 workers. [[Photo caption]] Gallo voting AP Wirephoto Members of the California Agricultural Labor Relations Board inspect challenged ballots in the Gallo Windery union election Wednesday night. [[end photo caption]] [[Header]] Lettuce talks to end; resolution forthcoming [[end header]] [[Handwriting]] 2-19-75 DAILY IOWAN [[end handwriting]] [[bold]] By RANDY kNOPER Staff Writer [[end bold]] [[Article text]] A representative of the Chicago Association for Legal Education (CHALE) said Tuesday that negotiations with UI officials concerning the lettuce boycott will be ending soon, with a final resolution coming in a couple of weeks. Arturo Ramirez, L2, said the negotiations are being conducted in an attempt to work out a compromise on the university's lettuce-purchasing policy. [[bold]]Meanwhile, a spokesman for the United Farm Workers Support Committee contested the claim of a Union spokesman that the boycott of the Union cafeterias is having no effect. [[end bold]] Anthony F. Burda, manager of the Union Food Service, said statistics from Monday show no decrease in sales. "We're holding the average," Burda said. "Nothing has changed. We have the same number of people, the same dollar quota. We've sold the same number of entrees as in a normal day." Gladys Gal, A4, a member of the support committee, said after the picketing Tuesday afternoon, "Whether we are having an effect or not, the Union bureaucracy will say we are not." [[bold]]The support committee called for the boycott of the Union Feb. 10 "to force the university to stop buying non-UFW lettuce. "[[end bold]] Eleven persons picketed at the Union's south door Tuesday. One of the persons who joined the picket line Tuesday was Igal Roodenko, former chairman of the War Resisters League (WRL). Roodenko said he has picketed with UFW members in Valencia, Calif. "Seeing the poverty and despair that the farm workers live in is a moving experience." he said. "And the extraordinary think about the farm workers is that they have not turned bitter. They have a moving and beautiful vision for a future life," he said. Support committee members said Tuesday that there will be a mass rally at the Union Thursday followed by a march to Jessup Hall and a rally there.